A few weeks back, we saw the coverage from Supanova in Perth with lots of cosplayers, mass media guests and huge hauls of toys and comics. And on the other side of the planet and the other side of the convention spectrum, I was at DexCon, a small-ish tabletop gaming convention in central NJ. DexCon is one of 3 conventions held by Double Exposure each year. The focus and mood of each varies a little, but they are all based on tabletop gaming. 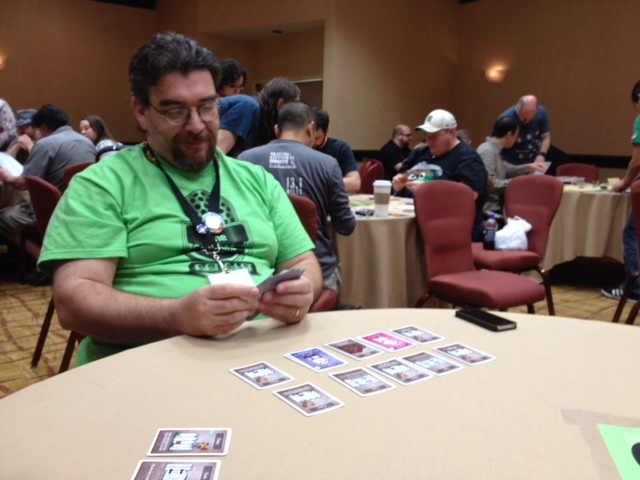 DexCon is big on playing scheduled games from your favorite publishers and while being much, much bigger, it has the down-to-earth feeling of a game night with your friends in your local game store. And that's exactly what I did. 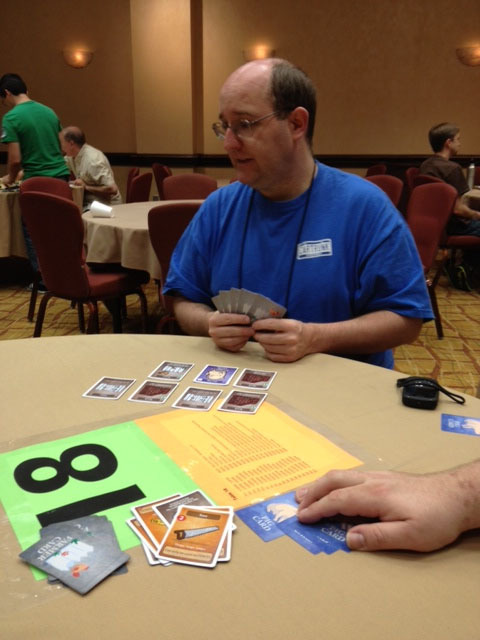 I played games with friends, some of which I see more regular than others, as well as a few new ones that I met at the convention for the first time. I mostly played prototypes too, including one that's launching on Kickstarter next week and one that's currently on there. I'm going to break the coverage up into a few parts and today's part will focus on pigs and fireworks. Somewhat fitting for a July 4th holiday weekend convention. 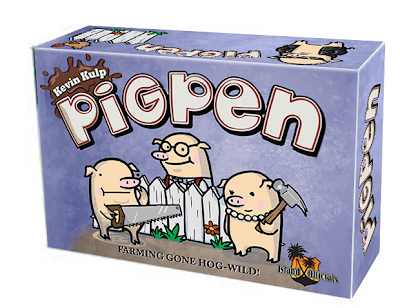 We started the morning off with Kevin Kulp's Pigpen. The main gaming room consists of tables with scheduled events taped onto the tablecloth. This is AWESOME. You can see exactly when the table is scheduled to be used next, instead of the unknown. In smaller conventions you could get booted from your table because it was already scheduled to be in use, and with it right in front of your face, you can plan accordingly. 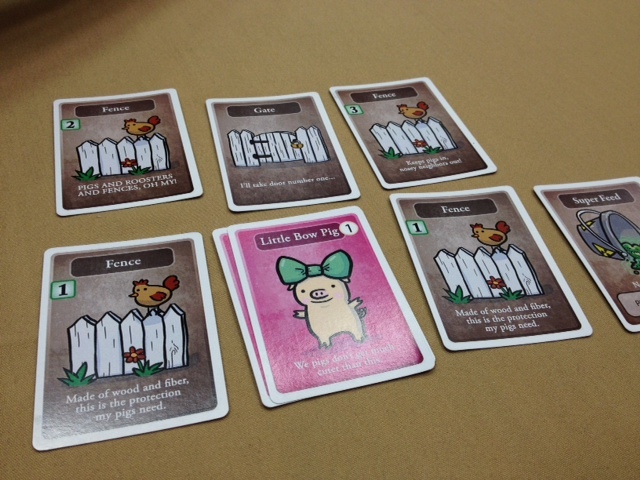 In Pigpen you build pens to gain pigs, which each count as points. You also knock down your opponents' pens to eliminate their points. We played with Anthony Racano of The Cardboad Jungle podcast, John Moller of Unpub and Chris Zinsli of Cardboard Edison. These are all good friends of ours that we don't get to see too often. And being good friends, it was quite a rowdy game. The struggle for pigs went back and forth and in the end it was a three way tie, broken by the player with the highest pig. Pigpen is headed for Kickstarter next week. It's being published by Island Officials (Pixel Lincoln, Orion's Oddysey - DS). I helped out with the development side of things and can't wait to see this get out there. It was still early and our brains were still at their peak, so we took a shot at Hanabi with Dan Zuccarelli and Adam Dickson of Perpetual Geek Machine. Dan and Adam live within 5 minutes from me, yet we never see each other outside of conventions. 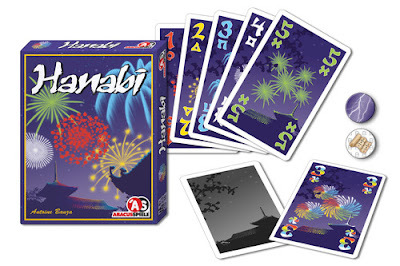 Hanabi is a very thinky game about fireworks. You play with your cards facing the other players and together try to help everyone figure out which cards you have. You can give clues to the other players, but there are rules in what you can and cannot say. Cards have colors and numbers on them, and you can point out which cards are a certain color or certain number, but you have to point out all of the cards that apply. From here, players need to place cards down in order from 1 − 5 within their matching colors. If you play a card out of order, you do not gain points from it. The goal is to get as close to 25 points as possible and we failed with 18 points and a blown fuse. Still had a blast though. Halfway through the game I received this hilarious tweet from across the room. Since the event, Hanabi has been announced as the Spiel des Jahres winner, which is one of the most prestigious (if not THE most) awards in tabletop gaming. It's basically the German Family Game of the Year, which propels sales throughout the world. Congrats to all involved as the game is wonderful. Next up are games about the king, the president and throwing cards... stay tuned!